For one of the two men who have made it to this year’s Name of the Year final, destiny awaits. By this time next week, Canadian hockey player Jimbob Ghostkeeper or California family practitioner Dr. Narwhals Mating will be etched in NOTY lore. 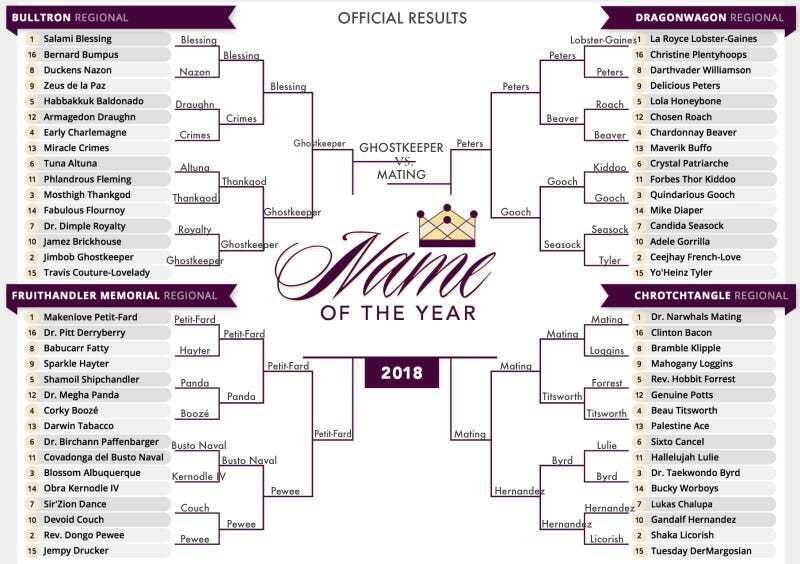 By navigating another wildly competitive field, the 2018 winner will join an exclusive club—one that brings deserved glory, but also reflects the weight of owning a spectacular name. First let’s recap the paths our finalists took through the bracket. Ghostkeeper, who played a few games for the Fort Saskatchewan Rangers midget AA hockey team in Alberta, tore through the Bulltron Regional like a winger on a breakaway. The No. 2 seed skated past, in order, Travis-Couture Lovelady, Dr. Dimple Royalty, Mosthigh Thankgod, No. 1 Salami Blessing, and, in the Final Four, Makenlove Petit-Fard. Handicappers—literally the sports book Pinnacle—had Dr. Mating as the favorite to win it all. Seeded No. 1 in the Chrotchtangle Regional, the doctor took care of Clinton Bacon, Mahogany Loggins, Beau Titsworth, and Gandalf Hernandez. His Final Four opponent, Delicious Peters, was a light lunch. Along the way we discovered that Dr. Mating originally was Raymond Rex Spisak. But NOTY is good with legal name changes. But then Destiny met and married a fellow Oklahoman named Steven King—yes, Destiny Frankenstein married Steven King—and opted to take his surname. Destiny told the paper she’s still proud of the Frankenstein name but was happy to trade it for something shorter. We’re not worried about Jimbob Ghostkeeper or Dr. Narwhals Mating ditching their monikers. After all, Dr. Narwhals Mating changed his name to Dr. Narwhals Mating. And who wouldn’t want to be named Jimbob Ghostkeeper? Vote for one of them below, visit our website, and follow us on Twitter.